This article is about the American film. For the 2016 German film also known as The Promise, see Killing for Love (film). The Promise is a 2016 American historical drama film directed by Terry George and starring Oscar Isaac, Charlotte Le Bon and Christian Bale, set in the final years of the Ottoman Empire. The plot is about a love triangle that develops between Mikael (Isaac), an Armenian medical student, Chris (Bale), a Paris-based American journalist, and Ana (Le Bon), an Armenian-born woman raised in France, immediately before the Armenian Genocide. 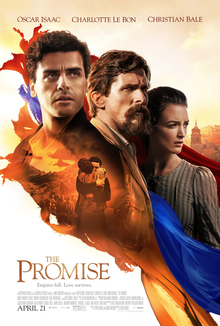 The Promise premiered on September 11, 2016, at the Toronto International Film Festival and was released in the United States on April 21, 2017, 102 years to the week of the Genocide, by Open Road Films. The film was a box office bomb, grossing just $12 million against its $90 million budget and losing the studio over $100 million, although the studio noted the main purpose of the film was to bring attention to the story, not make money. Mikael (Oscar Isaac) is an apothecary who lives in the small Armenian village of Sirun in the southeast part of the Ottoman Empire. In order to help pay the expenses for medical school, he promises himself to the daughter of an affluent neighbor, receiving 400 gold coins as a dowry. This allows him to travel to Constantinople and attend the Imperial Medical Academy. There, he befriends Emre, the son of a high-level Turkish official. Through his wealthy uncle, Mikael also meets Ana (Charlotte Le Bon), an Armenian woman raised in Paris, who is involved with an American reporter for the Associated Press, Chris Myers (Christian Bale). In due course, Mikael falls in love with Ana just as international tensions begin to rise with the outbreak of World War I. Mikael temporarily manages to avoid conscription in the Ottoman army through a medical student exemption with the help of Emre. But when he tries to save his uncle from imprisonment during the roundups of April 24, 1915, he is detained and sent to a prison labor camp himself. Mikael eventually escapes the camp, returning to his village only to find the Turks have violently turned on their Armenian fellow townspeople. His parents, and particularly his mother, persuade him to marry his betrothed and seek refuge in a remote mountain cabin where she soon becomes pregnant. A difficult pregnancy leads Mikael to bring his wife back to the care of his mother in the village. There he learns that Ana and Christopher are at a nearby Red Cross facility and he goes to seek their help for his family to escape the imminent Turkish threat. Departing the mission with a group of orphans, they head back to Sirun to retrieve Mikael's family. Along the way, however, they encounter a site of a massacre, as it becomes clear all of Sirun's inhabitants, including Mikael's family, save his mother, have been killed by Turkish troops. Chris is captured by Ottoman troops and sent back to Constantinople, charged with being a spy and slated for execution by the authorities; with the help of Emre, and through the intercession of American Ambassador Henry Morgenthau, Chris is released and allowed to depart for Malta. Once there, he boards the French cruiser Guichen, as it prepares to set sail along the Ottoman coast. Emre's role in helping to save Chris is discovered and he is executed by a firing squad. Escaping pursuit, Mikael, Ana, and the orphans join a large group of refugees determined to fight off the Ottoman army on mount Musa Dagh. As they fend off repeated assaults, Mikael's mother succumbs to her wounds and is buried on the mountain. The refugees hold on long enough to escape on the back side to the coast as the Guichen comes to their rescue. But as the launches return to the ship, a Turkish artillery barrage throws Ana and Yeva, the young daughter of Mikael's uncle, overboard. Mikael jumps in after them and is able to rescue Yeva, but Ana drowns. In a voice over, Mikael recounts that he adopted Yeva and together they settled in Watertown, Massachusetts. During Yeva's wedding reception in 1942, with the Armenian orphans who have now grown up in attendance, Mikael presides over a toast, wishing good fortune to their families and the generations to come. Rade Šerbedžija as Stephan, the Mayor of a small Armenian town that leads a group of refugees to fight the Ottoman army. James Cromwell as Henry Morgenthau Sr. The story of The Promise was based on an unproduced screenplay titled Anatolia by Robin Swicord, though Terry George completely rewrote the screenplay. Swicord says, "There’s some very fragmentary bits of my story that are in there, but he invented the Christian Bale character and changed the other characters. I had a medical student in my screenplay, but he wasn’t at all like the character in The Promise." Filming began in Autumn 2015 in Portugal, Malta, and Spain, with the shooting scheduled to last until December. Reshoots took place in New York in May and June 2016, ending in early June. The entire budget was donated by American businessman of Armenian origin Kirk Kerkorian. The film premiered at the 2016 Toronto International Film Festival on September 11, 2016. Shortly after, Open Road Films acquired distribution rights to the film, and set an April 28, 2017, release date. The release date was later changed to April 21, 2017. The Promise grossed $8.2 million in the United States and Canada and $4.2 in other territories for a total of $12.4 million, against a production budget of $90 million. Deadline Hollywood calculated the film lost the studio $102.1 million, when factoring together all expenses and revenues. In the United States and Canada, The Promise opened alongside Unforgettable, Born in China, Free Fire and Phoenix Forgotten, and was projected to gross around $5 million from 2,251 theaters in its opening weekend. It ended up debuting to $4.1 million, finishing 9th at the box office. Deadline Hollywood attributed the low opening to the lack of critical support and the film being released in the spring to coincide with the anniversary of the Armenian Genocide, instead of in the fall during award season. Open Road's president of marketing Jonathan Helfgot said the film's goal was not purely money related, saying: "[While] we certainly hoped for a better box office result ... It was about bringing the world's attention to this issue. And looking at the amount of conversation ... it's undeniable that there's been more focus and attention in the past two weeks than the past hundred years since the atrocity took place". On review aggregator website Rotten Tomatoes, the film has an approval rating of 49% based on 130 reviews, with an average rating of 5.7/10. The site's critical consensus reads, "The Promise wastes an outstanding cast and powerful real-life story on a love triangle that frustratingly fails to engage". On Metacritic the film has a score of 49 out of 100, based on 30 critics, indicating "mixed or average reviews". Audiences polled by CinemaScore gave the film an average grade of "A–" on an A+ to F scale. Benjamin Lee of The Guardian gave the film 3 stars (out of 5) and called it an "often soapy but well-intentioned and extravagantly mounted epic". Richard Roeper of the Chicago Sun-Times gave the film 3 out of 4 stars, saying: "Yes, The Promise veers into corny territory, and yes, it’s derivative of better war romances — but it’s a solid and sobering reminder of the atrocities of war, bolstered by strong performances from Isaac and Bale, two of the best actors of their generation". Ara Sarafian, director of the Gomidas Institute in London and a leading historian of the Armenian Genocide, praised the film for its historical accuracy. "The key themes were historically accurate", he said. "The producers did not take license to go beyond the historical material at hand yet they managed to capture much of the enormity of the Armenian genocide". Sarafian also commended director Terry George for his "well balanced and creditworthy" sense of history. Harout Kassabian of The Armenian Weekly said the film will help the world recognize the trauma of the genocide as it has long been felt by Armenians: "The personal connection developed with the characters helps deepen the empathy felt by the audience". Numerous celebrities reacted positively to the movie. By the end of October 2016, before its official release and after only three pre-release screenings in September 2016 at the Toronto International Film Festival to small audiences, IMDb had registered over 86,000 ratings for the film, 55,126 of which were one-star and 30,639 of which were 10-star, with very few ratings falling anywhere in between. The majority of these votes had been cast by males outside of the US. By mid-November the total was over 91,000 votes, with over 57,000 one-star votes. Commentators assessed that these were mostly votes by people who had never seen the film, and that the one-star voting was part of an orchestrated campaign by Armenian Genocide deniers to downrate the film, which had then initiated an Armenian response to rate the film highly. Grassroots attempts to fight against false ratings have gone viral, including a video by Harvard student Michael He that has received 300,000 views. At the time of its American release the film had a 5.5/10 from 129,241 votes, and as of November 11, 2017 holds a rating of 6.0/10 based on 157,865 votes. ^ a b c "The Promise (2017)". Box Office Mojo. Retrieved July 22, 2018. ^ a b "Box Office: 'Unforgettable' to Get Burned by 'Fate of the Furious'". Variety. April 19, 2017. ^ a b McNary, Dave (15 June 2015). "Christian Bale, Oscar Isaac to Star in Romance 'The Promise'". Variety. Retrieved 14 September 2016. ^ a b c d e McNary, Dave (30 September 2015). "James Cromwell, Jean Reno Join Christian Bale's 'The Promise'". Variety. Retrieved 14 September 2016. ^ McKittrick, Christopher (24 May 2017). "Filmmaking is a Marathon: Robin Swicord on Wakefield". Creative Screenwriting. ^ "Survival Pictures | The Promise". www.survivalpictures.org. Retrieved 2016-12-08. ^ "'Hotel Rwanda' Director Revisits Historic Tragedy in 'The Promise'". Voice of America. 12 September 2016. Retrieved 14 September 2016. ^ Busch, Anita; Hipes, Patrick (December 9, 2016). "Terry George's 'The Promise' Lands At Open Road, Gets April Release Date". Deadline Hollywood. Retrieved December 9, 2016. ^ D'Alessandro, Anthony (March 29, 2018). "What Were The Biggest Bombs At The 2017 B.O.? Deadline's Most Valuable Blockbuster Tournament". Deadline Hollywood. Retrieved March 29, 2018. ^ "'Fate Of The Furious' Drives Five Wide Releases Off The Road With $38.6M Second Weekend". Deadline Hollywood. April 23, 2017. ^ "'Fate of the Furious' Stays on Top; 'Unforgettable,' 'The Promise' Bomb". Reuters. Retrieved May 20, 2017. ^ "The Promise (2016)". Rotten Tomatoes. Retrieved July 22, 2017. ^ "The Promise reviews". Metacritic. CBS Interactive. Retrieved April 26, 2017. ^ "CinemaScore". cinemascore.com. Retrieved April 22, 2017. ^ Lee, Benjamin (13 September 2016). "The Promise review – Oscar Isaac tackles Armenian genocide in cliched but involving romance". The Guardian. ^ Roeper, Richard (April 20, 2017). "'The Promise': Bale, Isaac strong in sometimes corny romance". Chicago Sun-Times. ^ Shakarian, Pietro A. (13 October 2016). "The Armenian Genocide Finally Gets Its Due With the Film 'The Promise'". The Nation. ^ Sarafian, Ara (15 April 2017). "The Promise: A Preemptive Sensible Discussion". Gomidas Institute. ^ Kassabian, Harout. (13 September 2016). "Kerkorian's Legacy Project 'The Promise' Premieres at the Toronto International Film Festival". The Armenian Weekly. ^ "#KeepThePromise: Hollywood sheds light on Armenian genocide". 28 April 2017. ^ "Armenian Genocide film gets 86,704 IMDb ratings off three screenings". Independent.co.uk. October 25, 2016. Retrieved January 1, 2018. ^ Busch, Anita (2016-09-15). "Kirk Kerkorian's Legacy: A Mainstream Feature About The Armenian Genocide". Deadline. Retrieved 2016-12-09. ^ Flows, Capital. "Genocide Denial Goes Viral: 'The Promise' And The IMDB". Forbes. Retrieved 2016-12-09. ^ Culture, Author: Brian Raftery Brian Raftery. "IMDb Voters Are Tanking Indies Before They're Even Released". WIRED. Retrieved 2017-03-09. ^ Hairenik (2017-04-28). "Getting to Know Michael He: The 'Armenia Enthusiast'". The Armenian Weekly. Retrieved 2017-05-01. This page was last edited on 25 March 2019, at 08:21 (UTC).